When it comes to battery solutions, we have across some that are created from cheap mushrooms and others that are created from harmful algal blooms. However, when it comes large scale commercial usage, niche inventions can only solve a certain limited percentage of market demand for batteries – especially with the scope of more electric cars and wearables making their way into consumer consciousness. 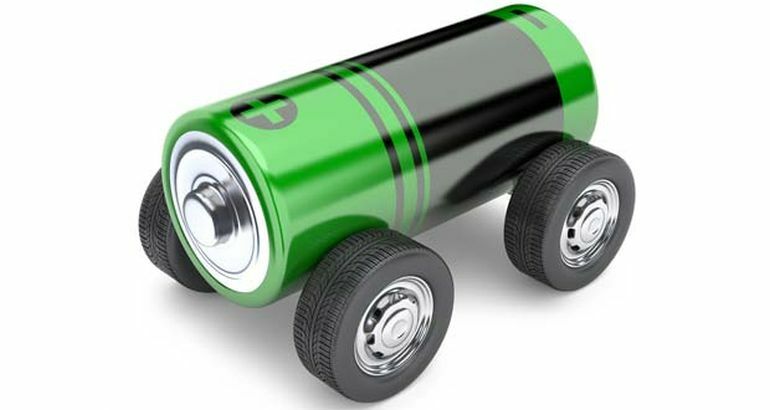 To that end, lithium-oxygen batteries (or lithium-air batteries) have often been claimed as the ‘holy grail’ solution for mass usage, given their theoretical prowess in energy density which is ten-times more than lithium-ion batteries. And now, researchers from the University of Cambridge have developed a working demonstrator of a lithium-oxygen battery, which is touted to have 93 percent efficiency and 2,000 charge-discharge cycles. When it comes to figures, the theoretical energy storage capacity of lithium-oxygen batteries pertain to 12 kilowatt hours per kilogram (Kwh/kg), as compared to 0.18 Kwh/kg for lead-acid batteries. In fact, the higher numbers are similar to the impressive energy storage capacities of gasoline (petrol). So hypothetically, if developed to its full potential, a lithium-oxygen battery system (incorporated inside an electric car) will account for 5-times less weight and 5-times less cost that its conventional counterpart. In essence, it means driving around 400 miles (or 640 km) on a single charge. Unfortunately, beyond theories, the existing technologies of lithium-air are not even close to the aforementioned threshold. One of the primary reasons being the unavailability of higher number of pore volumes in the current electrodes. This leads to ‘clogging’, which in turn prevents two very light elements, lithium and oxygen to diffuse through the material (for reacting and producing the ultimately efficient lithium peroxide). Credit: Tao Liu, Gabriella Bocchetti and Clare P. Grey. 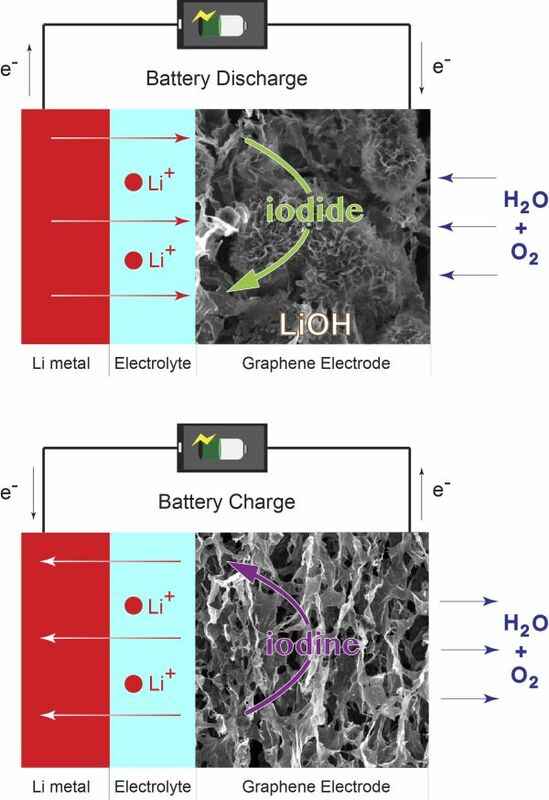 So, in a bid to rectify the predicament, the lithium-oxygen battery demonstrator in question here utilizes graphene – the ‘wonder’ allotrope of carbon. Boasting both its lightweight nature and one-atom-thick sheets, the material can certainly pose as a highly porous electrode. The scientists also made another significant change to the proton source, by replacing lithium peroxide (Li2O2) with lithium hydroxide (LiOH). 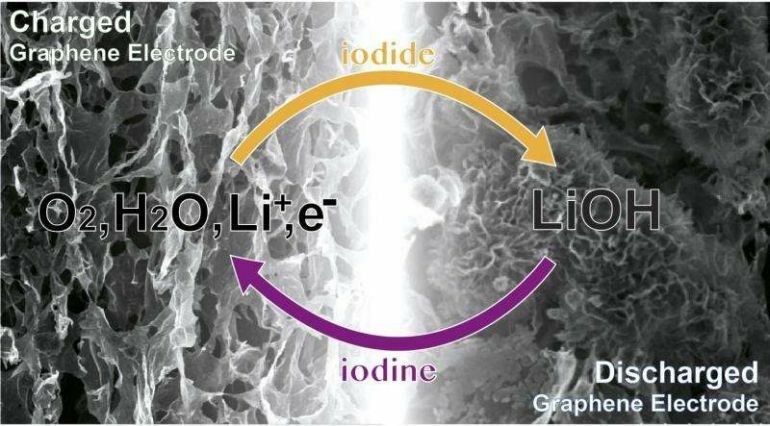 These modifications aided by the addition of water and lithium iodide, resulted in fewer number of ‘cell-killing’ chemical reactions, thus making the battery more stable. Once again, when translated to figures, this accounted for 2,000 charge-discharge cycles. Now of course, given the ‘demonstrator’ status of their lithium-oxygen battery device, suffice it to say, the specific technology is still in its nascent stage. Consequently, the scientists are looking forth to solve the still-existing problems, like the slow rate cycling and the carbon dioxide incompatibility with the cathode. So, when viewed from the perspective of practicality, a lithium-oxygen battery solution (with full potential) for electric cars might still be a decade away. However on the brighter side, given its advantage of high energy density, the technology can probably be used for smaller devices before its commercial debut in the big league. What we’ve achieved is a significant advance for this technology and suggests whole new areas for research – we haven’t solved all the problems inherent to this chemistry, but our results do show routes forward towards a practical device. While there are still plenty of fundamental studies that remain to be done, to iron out some of the mechanistic details, the current results are extremely exciting – we are still very much at the development stage, but we’ve shown that there are solutions to some of the tough problems associated with this technology. The study was originally published in Science.